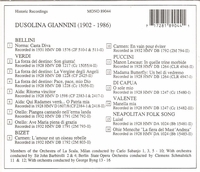 “The daughter of Italian parents, Dusolina Giannini was born in Philadelphia in 1902 into a thoroughly musical family. Not only were both her parents professional musicians, but her brother, Vittorio, became a successful composer, and a sister, Euphemia, was a member of the vocal faculty of the Curtis Institute of Music for many years. At the surprising age of twelve Dusolina sang Cieca in LA GIOCONDA, and then Azucena in IL TROVATORE, at her father’s theatre. Her unexpected début in Carnegie Hall took place in 1923, deputising for an ailing colleague, and two years later, after training with Marcella Sembrich, she made a formal operatic début in Hamburg as Aïda. In demand throughout Germany, Switzerland, in London, Vienna and the USA, Giannini added such rôles as Leonora (LA FORZA DEL DESTINO), Santuzza and Butterfly, and sang Alice Ford and Donna Anna in Salzburg; a strenuous touring schedule took her coast-to-coast in the United States and to Australia and New Zealand. Her appearances with the Metropolitan company were few - twenty, spread over six seasons from 1936 - but she was the Tosca of the opening performance of New York City Opera in 1944, subsequently appearing there as Carmen and Santuzza. During those years she also sang in Chicago and San Francisco with popular, if sometimes controversial, success, one of her rôles being Kundry in PARSIFAL, conducted by Monteux . In 1949 she was guest artist at the Berlin Staatsoper and the next year sang Carmen in Vienna.